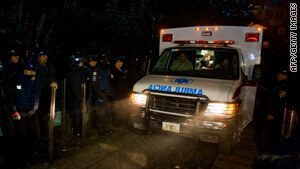 An ambulance leaves the scene of a helicopter crash near Mexico City, Mexico, on Sunday night. Mexico City, Mexico (CNN) -- An investigation continued Monday into a helicopter crash that killed five people, including prominent Mexican businessman Moises Saba Masri, the state-run Notimex news agency said. The Sunday night crash also killed Saba's wife, their son, their son's wife and the pilot, said Mexican President Felipe Calderon, in an official statement of condolence. Fog and other inclement weather may have played a role in the accident, which occurred at 8:35 p.m., said Mexico City's civil protection secretary, Elias Moreno Brizuela. The helicopter's tail hit a house and its blades struck a tree, Moreno Brizuela said at a news conference monitored by Notimex. The helicopter fell into a ravine that is about 90 feet (30 meters) deep, hindering recovery efforts, Moreno Brizuela said. Saba Masri was one of Mexico's wealthiest citizens, said to be worth billions of dollars. He was in the telecommunications business, owned construction and textile companies, was an investor in the TV Azteca network and owned two hotels in Acapulco, published reports said Monday. He was planning to build a 52-story mixed-use building in Mexico City this year.